The earthquake occurred 18km from Surigao City on Friday 10 Feb at 10:03 pm while residents were asleep. Mr Renato Solidum from the Philippine Institute of Seismology and Volcanology said that the quake was set off by movement in the Philippine fault, which sits in the Pacific “Ring of Fire” – a major area in the basin of the Pacific Ocean where a large number of earthquakes and volcanic eruptions occur. Schools were reopened for use as evacuation centres as village leaders urged residents to evacuate to a school building built on higher ground. The last major earthquake that struct Surigao was in the 1800s. Aftershocks are expected after such a strong earthquake. The Mexico City policy instituted by U.S. President Ronald Reagan in 1984 which prohibits US Federal funding of any foreign NGO that promotes abortion. Eight countries have joined an initiative to raise millions of dollars to help affected NGOs that refuse to abide by the policy. The Netherlands announced in January that it will set up a global fund to help women around the world access abortion services. So far, Sweden, Denmark, Belgium, Luxemburg, Finland, Canada and Cape Verde have lent their support. According to the World Health Organisation, 21.6 milion women around the world have unsafe abortions each year and 18.5 million of them come from developing countries. 13% of all maternal deaths are attributed to unsafe abortions. 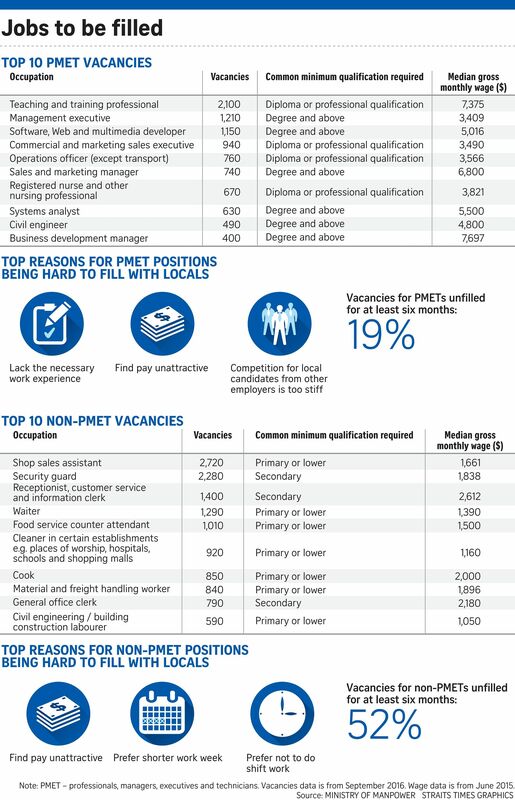 The latest report released by the Ministry of Manpower (MOM) on Tuesday showed that the number of vacancies for professionals, managers, executive sand technicians (PMETs) took up half of job vacancies in 2016, up 8 percent to 48 percent from 40 percent in 2013. Job vacancies requiring university degree qualifications (13,150 or 24% of vacancies) were one of the most in demand. Trade and Industry Minister Lim Hng Kiang said in parliament that despite the United States withdrawal from the TPP (Trans-Pacific Partnership), Singapore still has other options available. He pointed out that the remaining 11 countries may choose to still ratify the TPP but exclude the United States. Singapore would also enhance trade linkages with its regional partners through the ASEAN Economic Community and the Regional Comprehensive Economic Partnership (RCEP). The RCEP is an Asia-Pacific trade liberalisation initiative led by China that includes Australia, the 10 ASEAN countries, Japan, South Korea, India and New Zealand. The TPP (Trans-Pacific Partnership) is a massive trade deal between 11 countries, Australia, Singapore, Canada, Brunei, Peru, New Zealand, The United States, Vietnam. This trade deal contains measures to establish an investor state dispute settlement mechanism and both tariff and tariff barriers to trade. However, the new United States President Donald Trump has formally scrapped the TPP. The Manpower Minister Lim Swee Say has criticised Surbana Jurong, an infrastructure consultancy, for publicly labelling its employees as “poor performers” when firing these employees. 54 employees were fired by Surbana after being labelled as “poor performers”. The manpower minister had criticised Surbana Jurong through a statement to the media and a strongly worded letter to the staff of Surbana. It should also be noted that the management and unions of Surbana have reached a settlement. The affected workers will receive an ex gratia payment. The committee on the Future Economy (CFE) has released its report on this Thursday (9 February 2017). The CFE report noted that in order for Singapore to survive, Singaporeans must have deep skills, embrace overseas assignments and be prepared to learn throughout their lives. Singapore businesses must embrace technology, innovate, improve their productivity and expand their operations overseas by taking advantage of trade initiatives like the ASEAN Economic Community and the Regional Comprehensive Economic Partnership. Singapore must also boldly develop plans for city rejuvenation and create new spaces to ensure that Singapore is able to flourish in the global economy and is well-connected externally. United States President Donald Trumps defended his executive order to ban citizens from seven Muslim-majority countries-Iran, Sudan, Syria, Iraq, Somalia, Libya and Yemen from entering the United States for at least 90 days. Refugees from Syria are banned from entering the United States indefinitely. Mr Trump said that the goal was to give priority for admission to Christians and to screen out and block radical Islamic terrorists from entering the United States. Technology executives, Muslim leaders and human executives spoke out against the executive order. However Mr Trump supporters argue that this ban was necessary to protect the United States from potential terrorist attacks. The Philippine National Police (PNP) has suspended the war on drugs in order to focus its effect on purging rouge officers from its ranks. The PNP chief has stated that after the PNP has “cleaned their own ranks”, they would resume the war on drugs in the Philippines which has claimed thousands of lives so far. The move comes as the PNP was shaken by a scandal in which a South Korean man was abducted and murdered by rouge police officers. It should be noted that corrupted police officers committing crimes is nothing new in the Philippines, the PNP is regarded internationally as one of the world most corrupted institution. Philippines President, Rodrigo Duterte, meanwhile, has stated that the crackdown on illegal drugs would continue until 2022. A Canadian university student, Bissonnette, has been charged for opening fire on congregants in a mosque in Quebec City shortly before 8pm. The attack has left 6 people dead. The 6 victims were all males, aged from 39 to 60. The killings have exposed intolerance in Canada. The Canada government open door immigration policies stand in contrast to those of the United States under President Trump. Bissonnette has frequently posted anti-Muslim comments, however he is not known to be affiliated with any of Canada far right groups. It should also be noted that he is a vocal supporter of France far-right leader Ms Marine Le Pen. The nine SAF Terrex Infantry Carrier Vehicle (ICV) and other equipment seized on Nov 23 in Hong Kong has returned after two months. The Ministry of Defence said in a statement that the vehicles arrived at 2:40pm on 30 Jan and would be transported to an SAF camp for post-training administration. The vehicles were shipped back to Singapore by APL, the same shipping company from which the Terrex was seized from by Hong Kong officials. APL was shipping the Terrex vehicles back to Singapore after an SAF exercise in Taiwan when the vessel containing the vehicles were stopped by Hong Kong officials for “routine inspections”. Former policeman Iskandar Rahmat who was found guilty of stabbing to death Mr Tan Boon Sin ,67, and his 42-year old son Chee Heong will not be spared the noose. The Court of Appeal upheld his two death sentences on Friday (Feb 3). At his appeal in October of last year, Iskandar’s defence urged the court ot consider new evidence which include a psychiatric report. It started that Iskandar was afflicted with two mental illnesses at the time – adjustment disorder and acute stress reaction. It was also accompanied by forensic pathology reports which said that Iskandar suffered defensive injuries, giving credence to the defence’s case that Mr Tan Boon Sin was the aggressor and that Iskandar killed him in self-defence. Prosecutors however argued that the reports were unreliable as it was prepared three years after the murders and more than eight months after Iskandar was sentenced to death. Taiwanese fighter jets were scrambled as China’s Aircraft Carrier sailed into the Taiwan Straits. The Liaoning – the only Aircraft Carrier owned by China – was accompanied by Chinese warships and is on a course due north after a recent exercises in the South China Sea. Tensions between Taipei and Beijing are high due to an unprecedented phone call between President-Elect Donald Trump and Taiwanese President Tsai Ing-wen. President Tsai also transited in the United States on Jan 7 while on her way to Central America. The Falcon 9 suffered a launchpad mishap in September last year – an explosion destroyed its Amos-6 satellite payload. An investigation into the incident has allowed SpaceX to make corrective actions ano Falcon 9 has resumed operations. The Falcon 9 will be launched again on January 14th. A new bird flu case was confirmed by Taiwan, making it the fourth case this year. More than 43,000 birds have been culled in the country so far. South Korea, Japan and mainland China have also been hit by outbreaks of avian flu. The last major outbreak in China claimed 36 lives. More than 40% of Singaporeans are not getting enough sleep each week, according to a study by SingHealth Polyclinics. The findings come after a study from February to June 2015, during which the team surveyed a total of 350 adults at the Sengkang and Bukit Merah polyclinics. Sleeping less than seven hours was considered insufficient, which in the long run can affect the body’s immune system, memory, concentration and daily functioning. Respondents who used computers or laptops to surf the web of play games in their bedrooms were found to be more likely to lack sleep on weekdays. However, more people who used mobiles devices in bed were able to get enough sleep on weekends, compared with those who do not. Students who are summoned to police stations for interviews while they are in school will be accompanied by a school officer familiar to them. The changes come after the suicide of North View Secondary School student Benjamin Lim on 26th January last year. He was accused of molesting an 11-year-old girl. At the time, it was not the practice for juvenile suspects to be accompanied by school officers. The Ministry of Home Affairs (MHA) announced last week a new scheme that will enable “Appropriate Adults” who are independent, trained volunteers, to accompany young suspects during police interviews. The measures will come into effect next month in all primary and secondary schools, as well as junior colleges.